It’s time to GO BIG at Silverstar, and we have something for everyone! 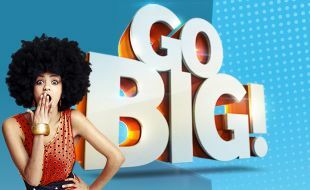 Join us for the Go BIG festival where you can WIN BIG, EAT BIG, LAUGH BIG and PLAY BIG from now until end August 2018. It’s GO BIG time at Silverstar, where there’s so much for everyone with 8 cars to be given away, loads of prizes and more ways to win this winter season with our GO BIG promotion worth over R2.8million in cash, cars and prizes. Play Slots and Tables and stand a chance to win 1 of 8 Renault Dusters and awesome cash prizes in our exciting money shower activation from 4 June to 25 August 2018. Guarantee your rewards with our GO BIG milestone rewards and spin the GO BIG Wheel every Tuesday for Black Card holders and every Wednesday for Platinum and Gold card holders starting 26 June to 22 August 2018. Stand a chance to win an all expenses paid holiday to the Seychelles when you take part in our Spin the wheel activation. Tsogo Sun Rewards Members enjoy instant *discount (from 10% off) may not be used in conjunction with other discounts. Enjoy Laser tag or a game of bowling in the biggest games arcade in the Westrand for just R35 per person and SAVE BIG! Time to relax at no better place than your favourite entertainment destination in the Westrand. Soulstice Day Spa has great winter warmer offers and the Southern Sun Silverstar will ensure you get that much needed R'n'R. Bring out the kid in you or bring the kids to enjoy our BIG Playground with over-sized favourite games like giant snakes and ladders, Tic tac Toe, Twister and more to be enjoyed by the whole family. Why hibernate when you can PLAY BIG at Silverstar with the “PLAY BIG” PLAYGROUND of your favourite games – just supersized! Free Entry until 10 August 2018. SHOUT BIG in support for the boys in green and gold and show your support at MTN’s Boktown at Silverstar. Watch the Castle Lager incoming series on the BIGGEST outdoor screen in the Westrand and enjoy a day filled with family fun: live entertainment, price giveaways, food and beverage sales, appearances by SA Rugby Legends, My Players stars and Bokkie – the official Springbok mascot. Come and Shout BIG at The Battle 2018. The Battle is a 3 day CrossFit Event showcasing the talent South Africa has to offer. CrossFit M4M and BST CrossFit joined forces in 2014 to put together a fun competition that allows individuals of all levels of fitness to take part in. The event has grown since then and every year just gets bigger and better. The goal of The Battle is to provide athletes a platform to showcase their fitness and skills. With various divisions to take part in no one needs to be left out. The event takes place from Friday, 17 August to Sunday, 19 August 2018.